Hey, it’s list season. Here’s one about Macross Frontier. Fellow grump Mora informs me Frontier features everything you should expect from the 25-year-old franchise. In fact, Frontier pleased fans so much it single-handedly revitalized the ailing brand in Japan. It’s like the Mega Man 9 or Super Smash Bros. Brawl of its kind, so full of nostalgic winks and throwbacks to previous series fans can’t help but squeal at their favorite moments revisited. 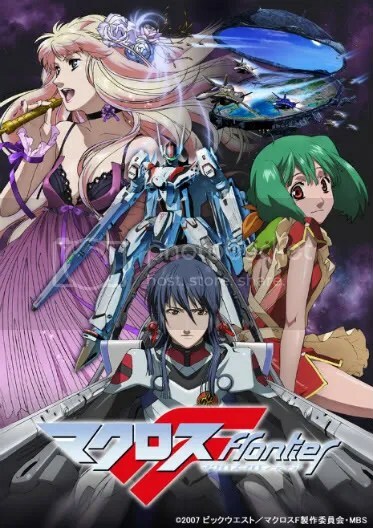 One episode details the filming of a movie adaptation of the events of Macross Zero. The theme song from the Macross movie, Do You Remember Love, returns at several key moments of the series. There’s a simmering love triangle, eye-catching missile effects, a bearded ship captain with a scar and a hat strategically hiding one eye, enormous transforming space ships … Even if you’re unfamiliar with the various Macross tropes, as I am, you should be able to appreciate Frontier regardless of the vast history behind it. And if you like it there are at least a dozen more similar series to check out.